UPDATE: October 2015 – Sadly this lovely friendly little café has closed. It has been taken over by Cuppacheeno. Springs Cafe has sprung up where Tazzina once was, behind the West Meon Village Shop. We said our farewells to Suzie, who has served us well on our cycle rides over the last couple of years or so. Mark & Kate have taken over with the new name. They are a very nice, young and friendly couple who go out of their way to make you feel very welcome. (Yes, this is another gushing post just like Helen’s one on Mowies yesterday). My friends and I cycle over to Springs Cafe at least once a week. 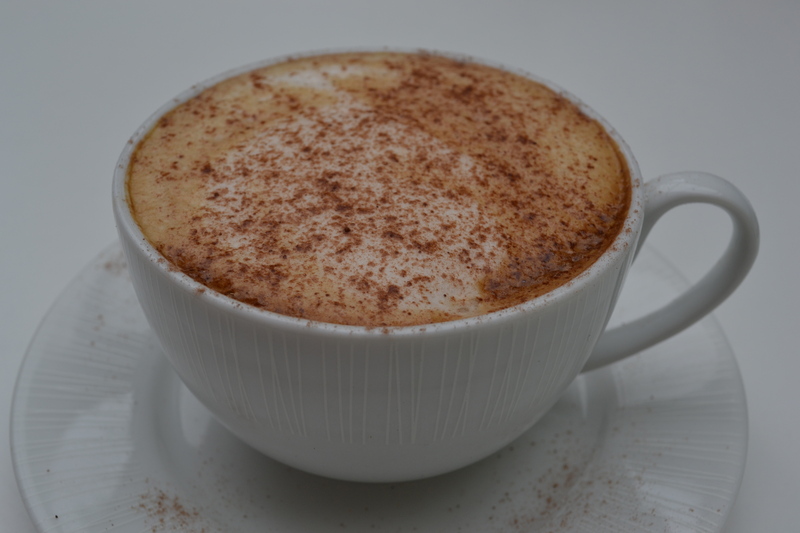 On our very first visit (they only opened at the beginning of this month) I had a lovely double-shot cappuccino. We sat outside in the sunshine. The cafe is very popular with cyclists, walkers and the locals. 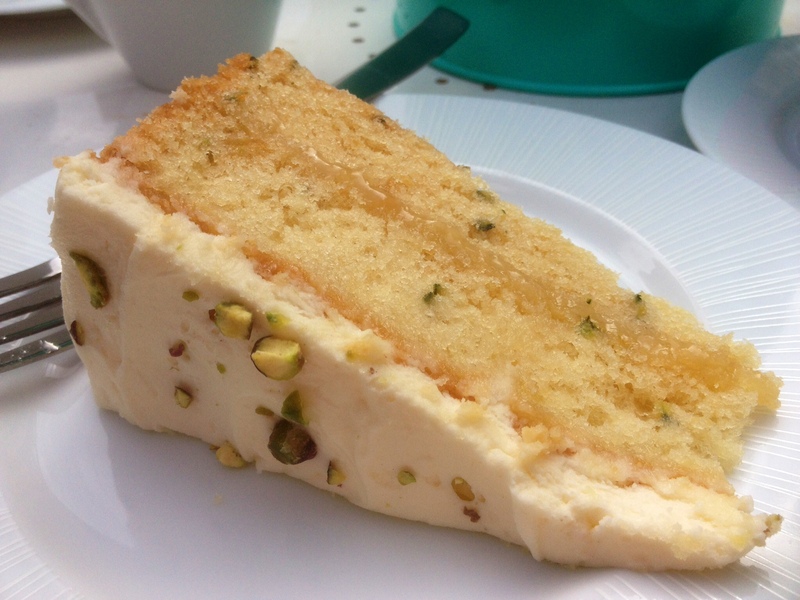 I enjoyed a nice large slice of the unusual sounding zucchini and lime cake, which had a sprinkling of crushed pistachios on top of the frosting. Strangely enough I had come across this cake recently in the John Lewis’ cafe in Chichester back in June. 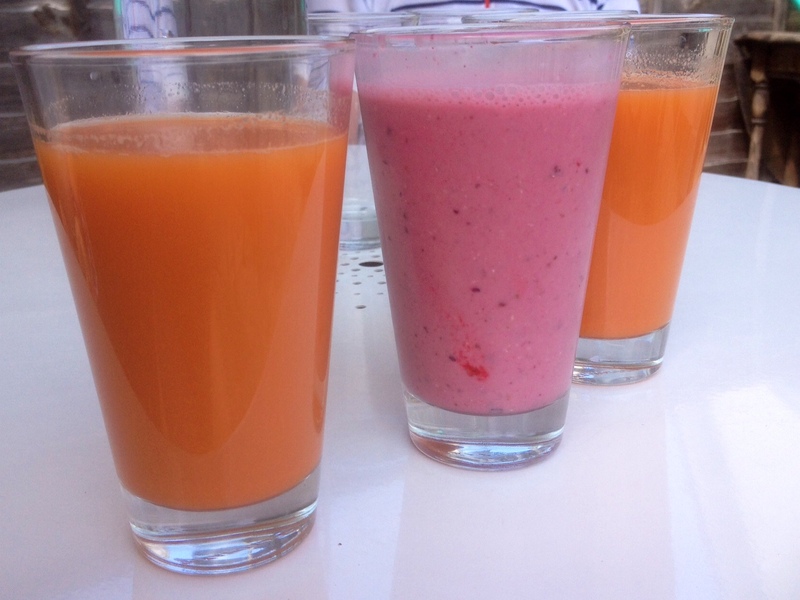 On my next visit – again, on a cycle ride with Neil and Jan – I thought I would be a little healthier and instead of a coffee we each had fresh health drinks. Jan and I had the ‘juice of the day’. Fresh cold-pressed carrot, ginger and orange. The ginger gave it a rather hard kick. Neil had the smoothie with fresh berries, milk and porridge oats. They all were tasty and their colours were beautiful. And instead of cake, I tried one of the breakfasts. Their ‘Bowl of Goodness’ is just that and you can have any combination of milk, yoghurt, or almond milk with muesli, granola or porridge and a choice of fruit compote, banana or fresh fruit. I always have the similar ‘breakfast bowl’ at Southsea Coffee Co. 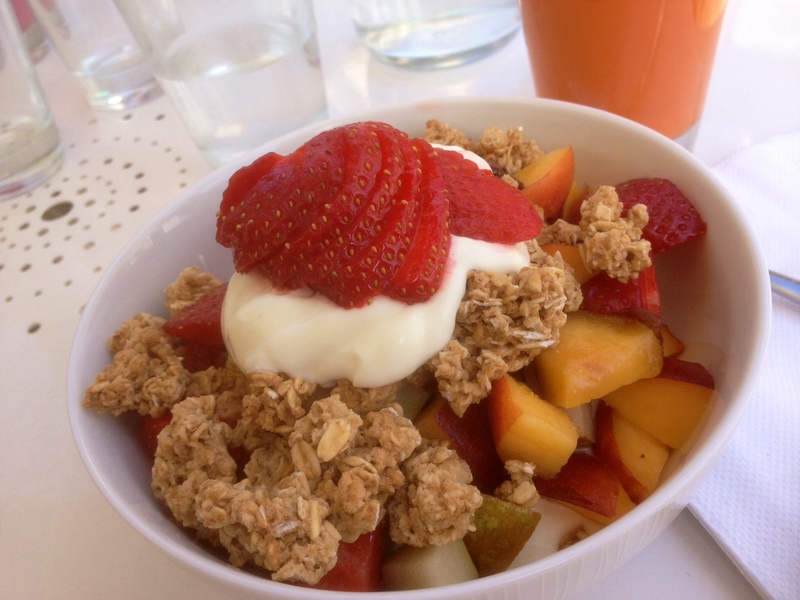 The fresh fruit of pear, nectarine and strawberries were cut up nice and small with large clusters of granola and topped with yoghurt. It helped me get up the hills afterwards, so it was obviously the correct choice. Geoff had an afternoon off work and as he hadn’t yet been to Springs Cafe, I thought it would be an ideal opportunity to try out their lunch menu. Now, I don’t normally have fish but on this occasion I thought I would as it sounded very nice and very different. For me anyway. 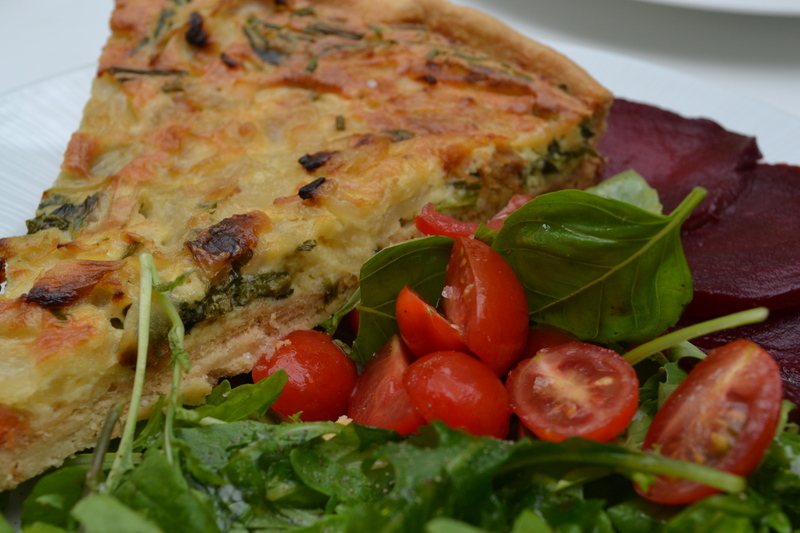 It was smoked trout in a tart with watercress and chives from the cafe’s garden. The trout was local ‘demerara and whisky smoked Alresford trout‘ from Hampshire Smokery which smokes just about anything and everything. I said I don’t normally have fish, I also don’t normally have anything smoked either. Would I like this tart? Yes! It was delicious. It was served slightly warm with a rocket salad, gorgeous tasting slices of cooked beetroot and halved baby cherry tomatoes. The pastry was as good as mine (which means it was excellent as I’m pretty darned good at pastry, if I may say so myself. Not that I like to blow my own trumpet of course). Geoff’s also not a fish eater – unless it’s in breadcrumbs from Waitrose – but isn’t as adventurous as me. 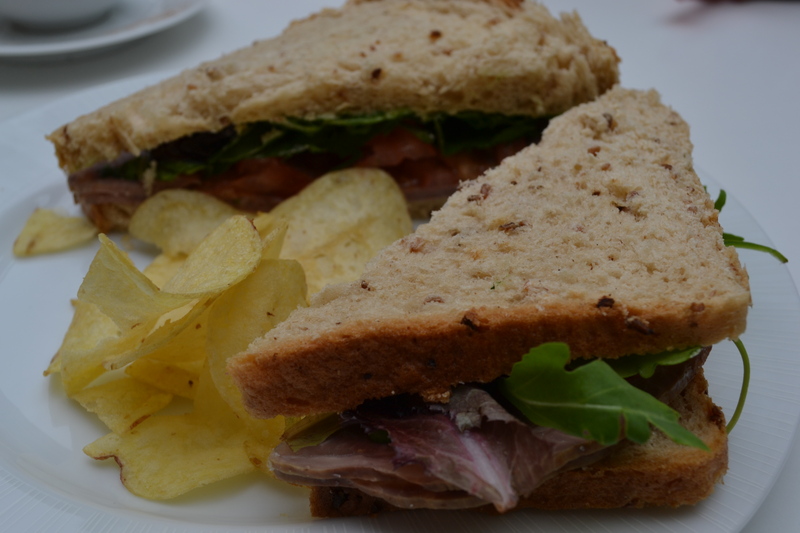 He settled for beef sandwiches on fresh granary bread, served with crisps. Of course, we both had a slice of cake. This time carrot, clementine and cardamon. Very nice and moist and certainly tasting of clementines. It had a lovely butter-cream frosting. 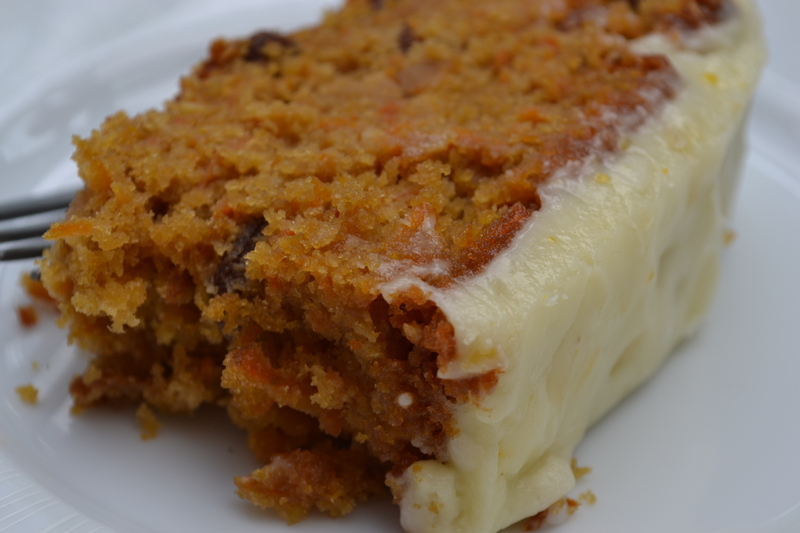 Slightly different than normal carrot cake. The previous week, Mark and Kate introduced an Italian pop-up restaurant one evening. Unfortunately I couldn’t attend which was a shame as I love Italian food. 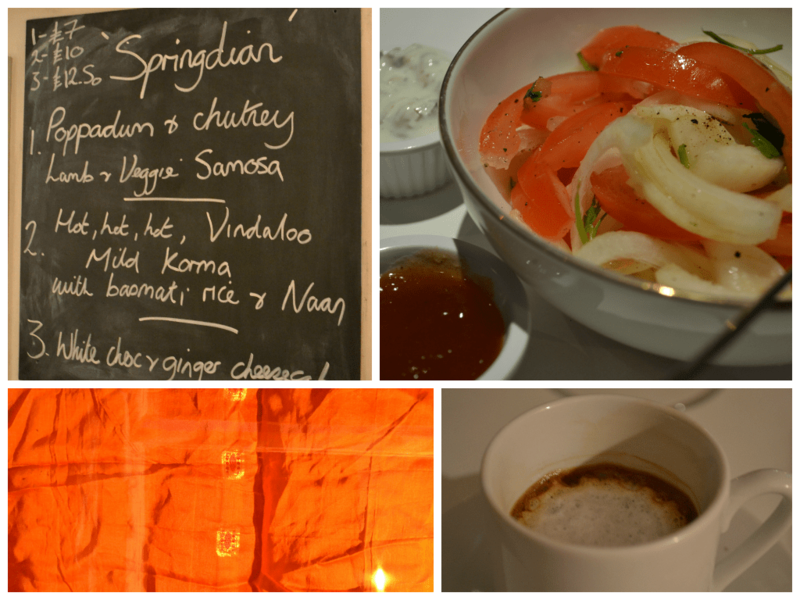 I was determined to go the following week though when they were holding an Indian evening. Or ‘Springdian Evening’ as they called it. I booked a table for four of us and took along my sister and her husband. And Geoff obviously. £7 for one course, £10 for two and £12 for three. Great value. Kate had put some lovely bright silk fabric up at the windows and we had candles upon the tables making it nice and cosy. We took along our own wine. We each had a couple of poppadoms with chutney and raita, freshly sliced tomatoes and onions. There was a choice between lamb or vegetable samosas. I had lamb and they were very tasty, made by a local Indian shop. 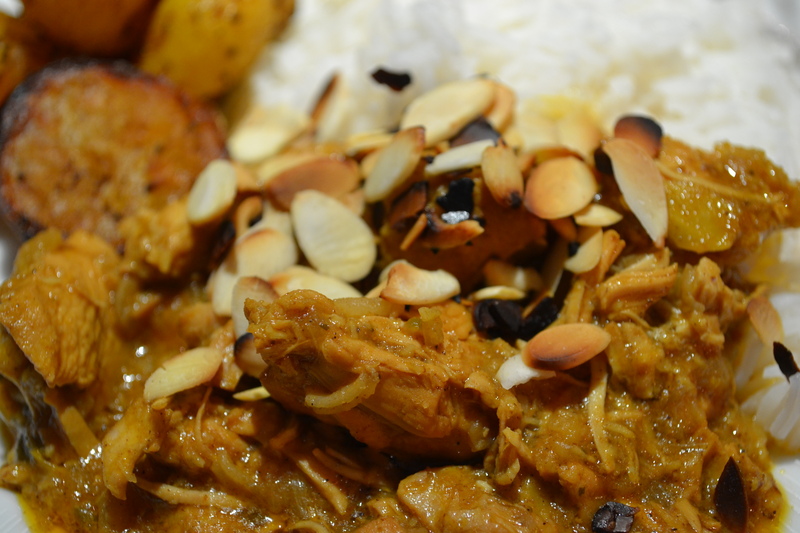 My sister and I were too scared to try the ‘hot, hot, hot vindaloo’ so went for the mild chicken korma. This was served with basmati rice and small roast potatoes. The dish was sprinkled with toasted flaked almonds. We all shared two warm naan breads. 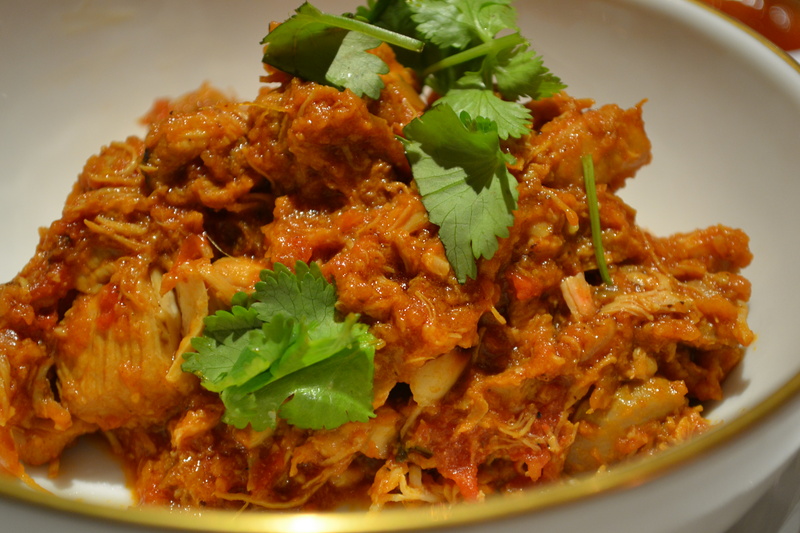 The men, being macho men, went for the vindaloo. Mark dished some of this out for my sister and I to try and actually it wasn’t quite hot, hot hot. More just hot. It was lovely. Ooh, and now for the dessert. 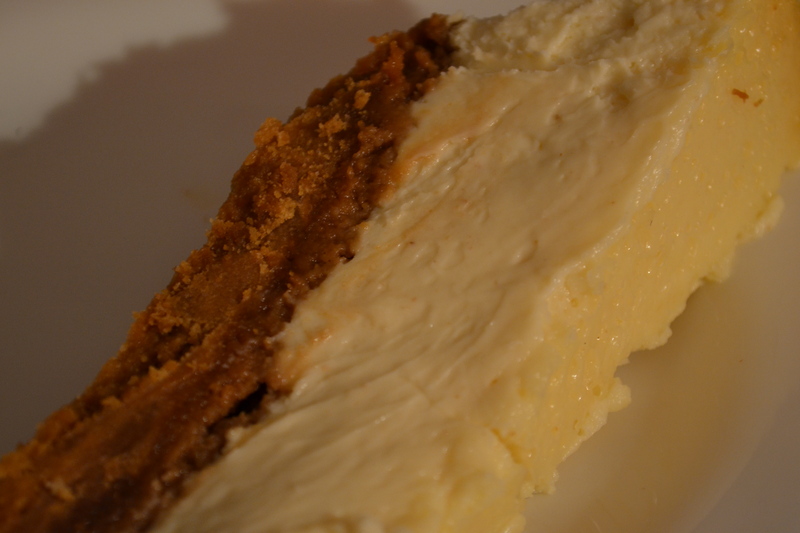 White chocolate & ginger cheesecake. The base had the ginger in and was very good, the white chocolate was divine, smooth and creamy. Afterwards I ordered an espresso but Mark asked if I wanted to try a cortado, which is an espresso cut with a small amount of warm milk. This Wednesday Geoff and I have booked a table for their Mexican evening and we’re looking forward to it very much.